Thank you for visiting the MEI site and taking the time to read a bit about us. MEI Appraisal Company. LLC. is a full service valuation company that specializes in tax based real property appraisals and valuation consulting services. MEI clients include large corporations, government agencies, mortgage and financial institutions, and legal and accounting firms. MEI was founded by Michael Ehrenberg to provide the highest quality appraisal valuation services available with a competitive pricing structure. 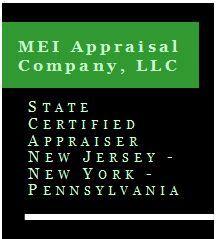 MEI Appraisal LLC - Brochure. To download the MEI on-line brochure, click on the image to the left. This will open the pdf tri-fold brochure in a new window for viewing or printing. Below is a link to Adobe Acrobat Reader. This or some other pdf reader is needed to read and print the MEI brochure.